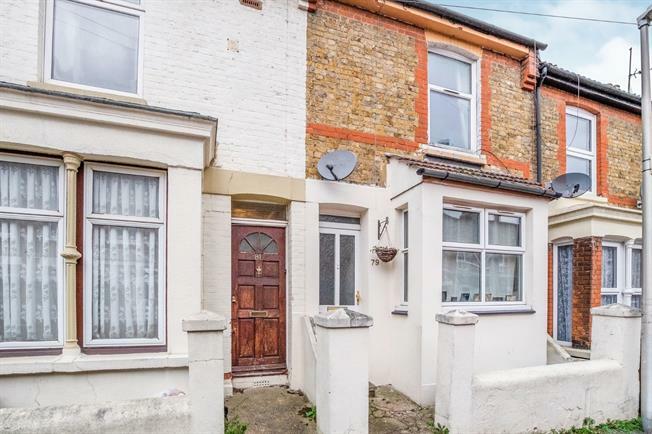 3 Bedroom Terraced House For Sale in Gillingham for Offers Over £190,000. UPVC front double glazed door. Radiator, laminate flooring, painted plaster ceiling. Triple aspect double glazed uPVC bay windows facing the front. Radiator, laminate flooring, chimney breast, painted plaster ceiling, ceiling light. UPVC back double glazed door, opening onto the garden. Radiator, laminate flooring, under stair storage, chimney breast, painted plaster ceiling, ceiling light. Double glazed uPVC window facing the side. Tiled flooring, boiler, tiled splashbacks, ceiling light. Roll top work surface, fitted and wall and base units, stainless steel sink, electric oven, gas hob, over hob extractor, space for. Double glazed uPVC window with frosted glass facing the rear. Radiator, tiled flooring, part tiled walls, wall lights. Low level WC, panelled bath, electric shower, pedestal sink. Double glazed uPVC window facing the front. Radiator, carpeted flooring, built-in storage cupboard, chimney breast, painted plaster ceiling, ceiling light. Double glazed uPVC window facing the rear. Radiator, carpeted flooring, built-in storage cupboard, chimney breast, painted plaster ceiling, ceiling light. Double glazed uPVC window facing the rear. Radiator, painted plaster ceiling, ceiling light.